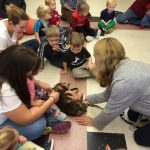 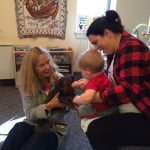 PAWS of CNY pet therapy volunteers Linda Adams and her Dachshund Gemma, Laura Hopkins and her Parson Russell Terrier Patches visited the Mom and Kids Childcare Cooperative in Skaneateles on October 5 with the goal of brining some smiles to the day’s little visitors. 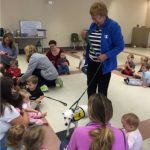 According to the staff at the Childcare center, the children at the center had a wonderful visit. 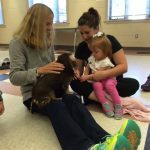 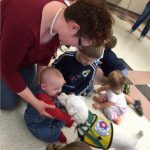 The staff observed definite improvements in the moods of the children, sharing that the number of crying children dropped dramatically when the PAWS of CNY therapy dogs entered the room. 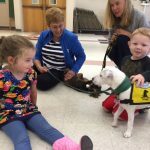 Pet therapy offers emotional support and happiness to children, adults, and seniors. 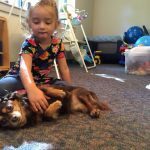 If you would like PAWS of CNY to visit your childcare center, please contact us today.